Stay one day for free! 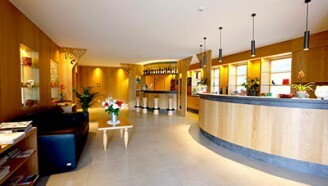 7 nights with half-board (exclude Tuesday) – pay only for 6! 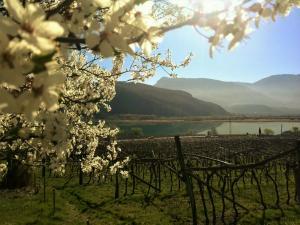 our vision: enjoy your stay in the middle of the vineyards! With a wonderful view over the most popular swimming lake in South Tirol: lake Caldaro. 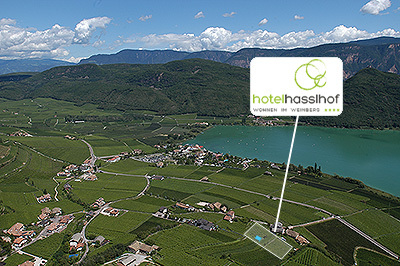 Welcome to the Hotel Hasslhof**** in Caldaro, the first Wine Hotel, in Caldaro on the lake. Enjoy the natural peace of this place, the breathtaking panoramic views with a mediterranean touch, and spend an amazing holiday at a high living standard, right in the middle of the vineyards. Enjoy your privacy, on lake Caldaro! 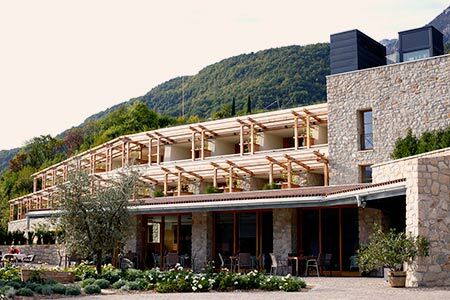 Located on a sunny hillside above the village of Caldaro in South Tyrol, the Hotel Hasslhof consists of the main house/hotel, a newly built annex, and the old house, which is run as a guest house. This last one has been used for decades and it’s been past through generations. In 2009 Anton Morandell and his family took over. In 2013 the guesthouse has been enlarged with a 4 star hotel, redefined as a “Wine-Hotel”, is now run with a new and original concept which sees the vineyard as the main attraction and as a source for positive energy and relaxation. Each of our “ateliers” is a luxury suite of 43 m², furnished in harmony with nature, packed with all the exclusive 4 star amenities, and with an own wine terrace measuring 15 – 20 meter square, with sun loungers and vine plants. The project bears the signature of south-tyrolean architect Hanspeter Demetz. The style of the new Hasslhof, harmoniously built into the delicate vineyard landscape, is a modern interpretation of the original architecture style of the Oltradige region. Almost imperceptible from the outside, the building bears “ateliers” and family suites on the first and second floor and the “wine-lounge” on the ground floor, the outdoor swimming pool on the roof terrace with stunning views over the vineyards, the Caldaro lake and the mountains overlooking the valley. There are more double rooms available in the old guesthouse.